The Circle (2017) - Sci-fi-central.com.  United Arab Emirates / USA  2017  110m   Directed by: James Ponsoldt.  Starring: Emma Watson, Ellar Coltrane, Glenne Headly, Bill Paxton, Karen Gillan, Tom Hanks, Beck, Nate Corddry, Mamoudou Athie, Roger Joseph Manning Jr., Joey Waronker, Michael Shuman, Nick Valensi.  Music by: Danny Elfman. When Mae is hired to work for the world's largest and most powerful tech and social media company, she sees it as an opportunity of a lifetime. As she rises through the ranks, she is encouraged by the company's founder, Eamon Bailey, to engage in a groundbreaking experiment that pushes the boundaries of privacy, ethics and ultimately her personal freedom. Her participation in the experiment, and every decision she makes begin to affect the lives and future of her friends, family and that of humanity. One would think that a top notch producer-duo like Anthony Bregman and Gary Goetzman, an amazing cinematographer like Matthew Libatique, an unbelievable composer like Danny Elfman, two talented editors like Lisa Lassek and Franklin Peterson, and incredible actors like Tom Hanks and Emma Watson would guarantee a great film, right? -- Wrong... this is why the screenplay is so important. To be completely fair, I haven't read David Eggers' novel, so I don't know if it's good or not, but if we base that judgement on the film, it sure as hell doesn't seem like it. Why is the script so poorly written? The first big problem is that we don't know our protagonist's intent or obstacle. We have no idea what she wants, what she's doing to get it, or what stands in her way. This is at the top of every screen writing seminar, course, book, or principle list that you can find. If this is not clear within the first 10 to 12 pages of your script, then don't even bother filming it. We do know that she dislikes her job and that she has a sick father whom she loves. But she's not doing anything to help her dad, and she's not looking for a different job either. She does go kayaking though, so... good for her! The job offer (inciting incident) that gets her to embark onto a promised adventure, comes in a phone call from a friend. A phone call that takes our protagonist by surprise. So, to make matters even worse, our main character is completely reactive. Things happen to her, she doesn't make them happen, which makes her dull and boring -- Something one would think could be a big decision-changer for actors like Emma Watson to accept a role in a film at this point of her career. But hey, maybe not! Our protagonist agrees to the interview (a very weird one that includes picking between her favorite Beatle and reacting to an inappropriate invitation to go out with her interviewer) and she gets the job! And now we embark onto the adventure. At first, everything is very expository. Tom Hanks' character is introduced as a quite literal Steve Jobs-like company manager, who believes in technology's power to help us know everything about everyone in the world, basically. Then, an opportunity to help her father reveals to our protagonist by, again, the same friend who offered her the interview in the first place. So, our protagonist is yet again reacting to what is happening to her. To make matters worse, what pushes her (very late so) to make her first big decision, is that she inadvertently decides to take a kayaking trip in the middle of the night, and go sailing onto the darkness with no life-vest (or even a flashlight for that matter), for a ridiculous nocturnal, meditative promenade (because, you know, YOLO). This really bizarre, nonsensical decision is what propels her to take action with Tom Hanks' character and take an active part of the all-time-surveilling-technology of the Circle. Then the story turns into a modern era "Truman Show" without the innovative factor of reality television, and with an improbable audience who is all-love-and-no-hate for our always innocent Mae Holland. (Seriously, this Utopia world presents no haters in the social media.) The technology gets so big, they challenge themselves to find any person in the world, with the help of their hundreds of millions of subscribers. The first person they challenge their users to find is an outlaw murderer woman. She is found within 10 minutes, and guess what? These hundreds of millions of users find her without a shred of mistakes. No one mistakes another woman for her, there are no complications, and her capture is done by a police officer with calm and accuracy. Let us just say that plausibility is not this film's strongest suit. The next person they challenge their users to find is an ordinary person who's not a part of the Circle's network, and who's a former friend of our protagonist. What happens next is simply too stupid to face, because people actually chase for this guy down a highway in the mountains and get him killed in live-feed broadcasting. And what's even worse: there are no consequences to his death. Instead, what happens is that Mae finally "opens her eyes" to the fact that what the Circle is doing is wrong (duh!) and that violating people's privacy could get them killed (oops!). And so, she designs a trap to expose the people behind the Circle and their true intentions (evil laugh). And guess what? SHE DOES IT! She exposes them, all their conversations, their plans, all their private correspondence, all of it! And do you know what they were hiding? -- Neither do I, because the screenwriter forgot to tell us, I guess... Or maybe he did write it but the editor cut that part out... or maybe the director forgot to film that part... or maybe it's not even in the original novel... who knows? And at this point, frankly my dear... who gives a damn? Yes, the antagonist played by Tom Hanks is a uni-dimensional character who we pretty much know nothing about. He has no intent either, no obstacles along the way, and no clear agenda at all. How they got Tom Hanks to act in this film, is just a complete mystery. Please, please, Tom, Emma, Anthony, Gary, Danny, Matthew, Hollywood, the studios, THE AUDIENCE..
Review by 12_Monkeys from the Internet Movie Database. 'The Circle' Is So Bad It's Almost Impressive. An almost insulting modern recreation of ''1984''. Not the scary film it should have been. The utterly scathing reviews are massively unwarranted. A tepid thriller about all-consuming social media can't square the circle. ‘The Circle’ falls disastrously flat. Basically two hours of an old man yelling at clouds. If anything, The Circle definitely captures the spirit of Silicon Valley. A disastrous misfire of epic proportions. THE CIRCLE is not the cautionary tale it intended to be. ''Black'' Mirror Without the Bite. 'The Circle' is a Surface-Level, Cartoonish Examination of Technology. 'The Circle' draws a chilling warning about social media privacy invasion. A frustratingly shallow spin on the balance between freedom and privacy. Black Mirror meets Silicon Valley, except it's neither funny nor frightening. Hanks And Watson Do Their Best In This Muddled, Messy Techno-Thriller. A cautionary tale for mainstream audiences. A savvy piece of social commentary. A tale of technology run amok. The Circle Is Like A So-So Episode Of Black Mirror. A toothless, bland satire of a Google fantasy dystopia. Like the latest Apple product, it's all sleek surfaces, it's both busy and dead. THE CIRCLE is an OK movie. Despite noble intentions ‘The Circle’ is often this obvious and cheesy. 'The Circle' Is A Timely Cautionary Tale. Movie Review: The Forgetful ''The Circle''. Film Review: The Circle (dir by James Ponsoldt). THE CIRCLE - Film Reviews. James Ponsoldt's ''The Circle'' - Review. Movie review: A terrifying future predicted in ''The Circle''. The Circle (2017) - Review. Film review: 'The Circle' - Movie Reviews. 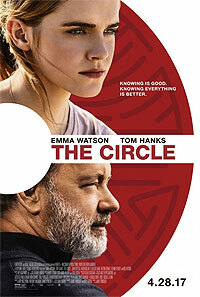 Review: "The Circle" with Tom Hanks and Emma Watson. Movie Review: 'The Circle' disappoints, rightfully thuds in box office. Review: James Ponsoldt''s ''The Circle'' fails in every way imaginable. 'THE CIRCLE' Review: Big Ideas, Awkwardly Executed. Review: 'The Circle' Is More Cautionary Tale Than Nail-Biting Thriller. Movie review: ''The Circle'' is all buzzwords, no substance.